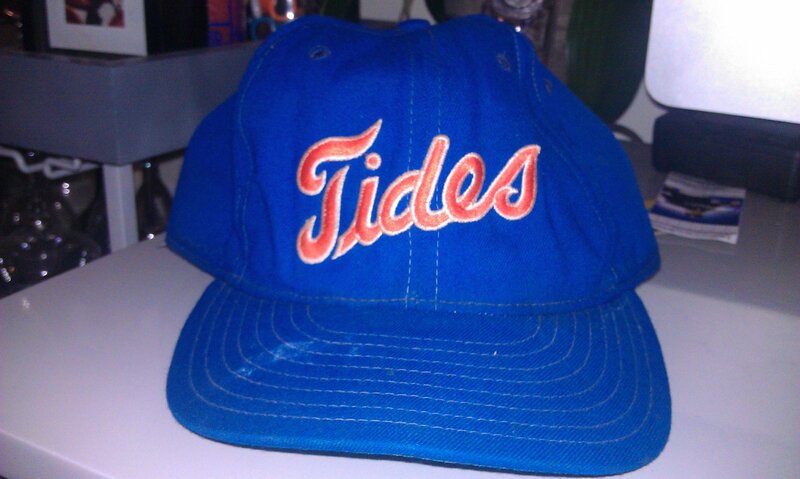 1992 Tidewater Tides Cap (game-worn by Kevin Baez) - FreshFittedFriday!!! I don't go to many Mets games and that is mostly because they've been a disappointing franchise to follow, but I'm also not a fan of the old Ebbets Field influence in the park's design. Despite all of the club's poor business decisions and overt tributes to the Brooklyn Dodgers' legacy, going to a Mets game is a big part of getting my "Flushing-on" in Queens. For me that means relaxing at a ballgame while drinking some craft beers and putting down a few shake shack burgers. It also means heading down to the Chinatown on Main Street in Flushing after the game to enjoy some duck buns, soup dumplings, bubble tea and other tasty edible Asian treats! I love Flushing for many food-related reasons but it doesn't do much to step up my fitted hat game like Brooklyn and the Bronx can. Hey look at that Steve Swisher card! 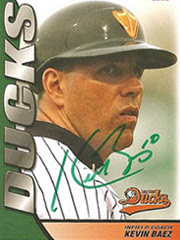 It is crazy to think about how when I got his autograph that he had a son (Nick, who is about my age) that would one day become a big league star! Check out the babyface on (then) 34-year old (my age now!) manager Clint Hurdle. I'm sure he and Ron Washington had lots of fun during their tenures in Norfolk but I'm also sure they'd have better things to talk about if their clubs ever met for interleague match-ups! One thing all of those guys in that picture above have in common is that they wore a cap just like this one here. At first glance this one doesn't look too bad! Flip the cap; flip the script son! This thing is so not FRESH! It's gotten some decent years of wear since Baez gave it to me but it definitely wasn't in great shape when he gave it to me either. I was so thrilled that a ball player gave me his cap that I wore it to many more Tides games over the next few years. I wore it so much that the other autograph nerds teased me by calling me "Baby Baez" (which now that I think about it sounds pretty cool) as well as "Baez Jr." (that one is OK) which then became shortened to "B.J." 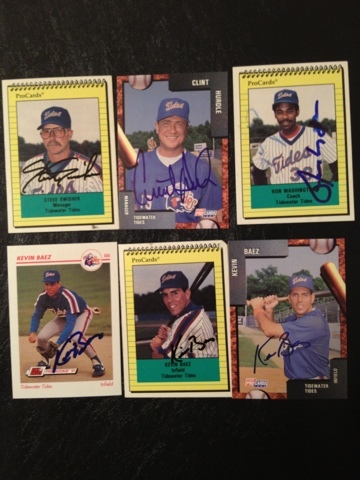 (not cool) but I didn't mind because I knew that one day I would have a blog where I would photograph my caps and autographed cards and share stories about how I got them. Oh wait; I didn't actually know that back then. So this cap originally had an interior lining on the reverse side of the team logo but it started to fray and little shards of whatever material it was made of started scratching my scalp which is why I'm balding today. Wait never mind that isn't the reason for that but I'm realizing now might be a good time to give a shout out to my maternal grandfather: Sup Papi! By the way he wasn't Dominican; that's just what we called him but he was as bald as the day is long and one day I will be too! 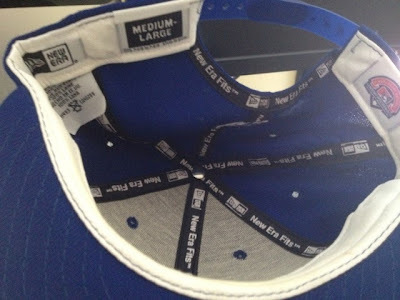 The MILB and New Era tags here are legit, but one thing that's interesting is that the New Era tag has a "small-medium" sizing on it. 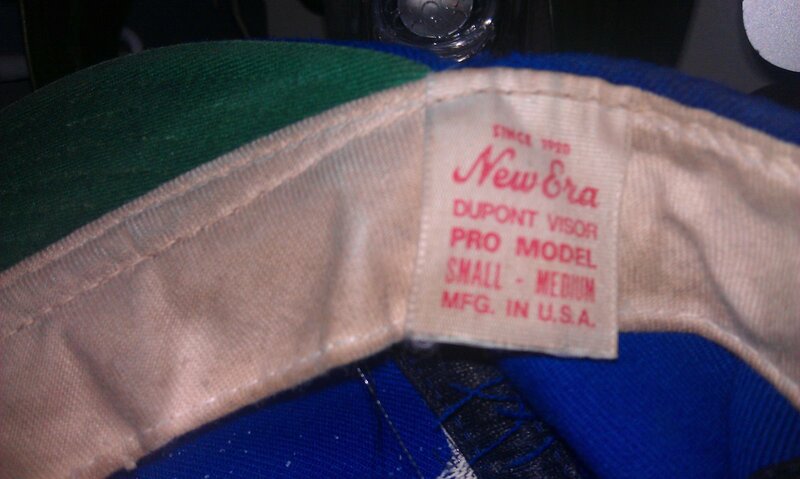 I don't have many snapbacks besides this one this one but I never realized that sizing description before. 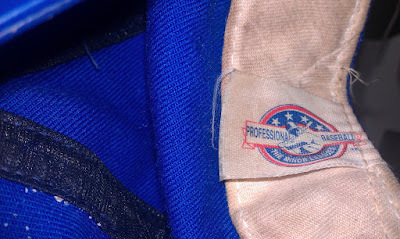 This old cap can also take pride that it was carefully crafted in America. USA, USA, USA! All in all it seems like a really beat down Fresh Fitted Friday selection but I feel the urge to honor my hometown team because I'm visiting my family in Virginia Beach. Also, the Tides regular season just ended and even though they are an Orioles affiliate now, I will always have fond memories of those former, future and never-would-be Mets like Kevin Baez and it's a great moment now for all the current players who are getting their own "September call-up" to the big leagues. Oh snap! You didn't think that I was going to share some sorry busted cap with you and call that a Fresh Fitted Friday did you? Please have some faith after all! Now this cap is a reproduction of one the Tides wore in the 1980's and although I'd like to have an original, I don't want the jericurl stains that usually come with a vintage cap from that era. 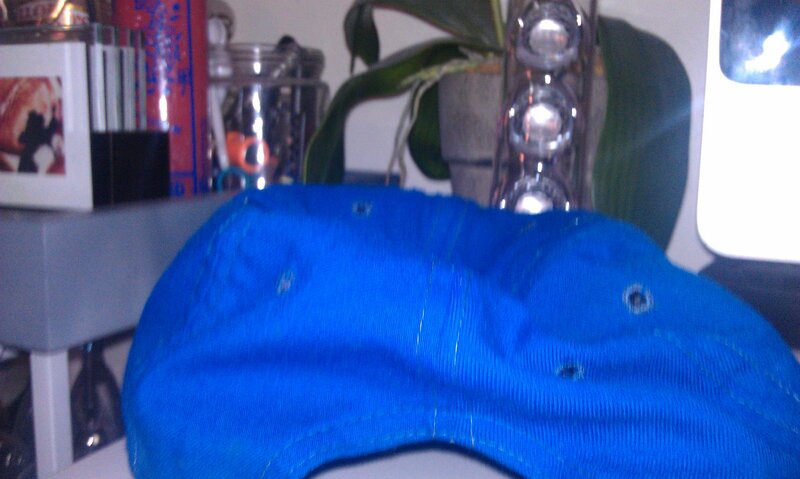 I really do like this cap though but the first thing that jumps out at me here is the BLUE underbrim. WTF?!? Another noticeable item is again the size tag reading "medium-large" which makes me wonder how standard that really is for snapbacks. I thought the whole point of the snapback was that the size of the cap would be irrelevant but I suppose they are made with some consideration there. 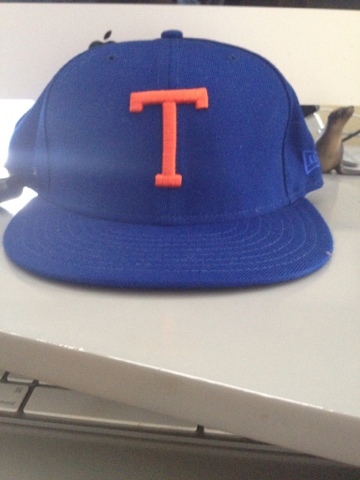 This is definitely a cap that I will wear to Mets games once the Baez cap officially disintegrates. 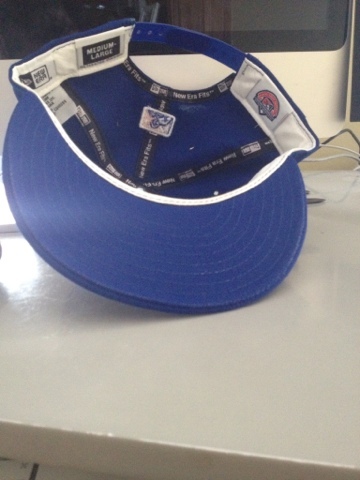 These days, only the serious Mets fans appreciate the history that their team shared with the Tides and while only the most seriously afflicted sufferers of baseball addiction would remember Baez, I will always remember his kind gesture in giving me his cap in early September some 21 years ago. In the "where are they now" section of the news, it turns out Baez is current manager for the Long Island Ducks, a team in the independent Atlantic League. 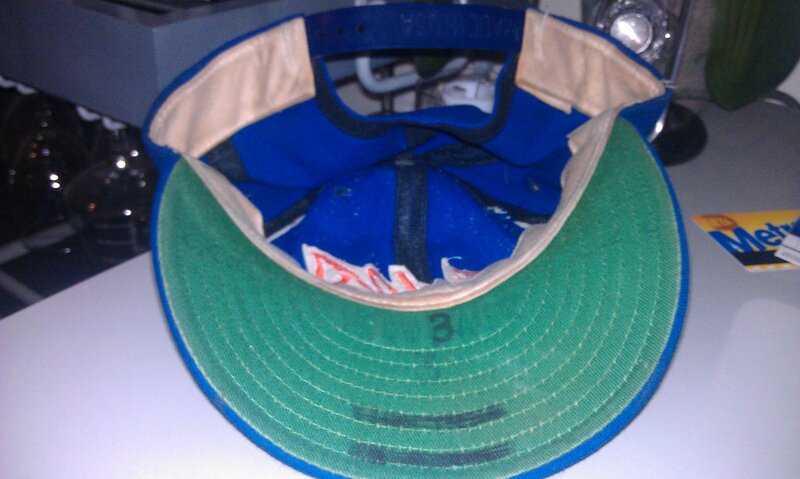 I keep saying one day I'll make it to one of their games and thank him for this great cap. Until then, cheers to Kevin Baez!